This February, a grand jury indicted rookie NYPD Officer Peter Liang on charges related to the fatal shooting last November of 28-year-old Akai Gurley. Gurley, an unarmed African American man, was killed when he stepped into the dark stairwell of the public housing building where he and his girlfriend lived with their two-year-old daughter. At the time, Liang and another officer were conducting a vertical patrol, a routine tactic in which police officers sweep public housing buildings in search of criminal activity. Liang drew his gun and fired a bullet that hit Gurley in the torso, killing him. Liang’s indictment has sparked protests from some Chinese Americans calling for the charges to be dropped. Meanwhile, another group of Asian American voices have stood by the grieving Gurley family to support the indictment, and to demand police reforms like an end to discriminatory and deadly vertical patrols. Twenty-four years ago, in October 1991, Korean American storeowner Soon-Ja Du was found guilty of voluntary manslaughter for shooting and killing a 15-year-old African American girl named Latasha Harlins earlier that year. Du had suspected Harlins of shoplifting, and engaged in a physical struggle with her inside Empire Liquor store in South Los Angeles. When Harlins angrily left her juice on the counter and turned to leave, holding the $2 that would have paid for her purchase, Du shot her in the back of the head. For taking Harlins’ life, Du paid $500 and served no prison time. Two weeks before Harlins’ death, four LAPD officers were caught on video brutally beating an African American motorist named Rodney King. When the officers were acquitted that following spring, Los Angeles erupted in civil unrest. The Los Angeles riots, as the five-day event came to be known, involved 10,000 federal troops, resulted in more than 50 deaths and some 12,000 arrests, overwhelmingly of Black and Brown people. It also caused $1 billion in damages, heavily targeting Korean-owned businesses. Korean Americans dubbed the riots, which began on April 29, 1992, “Sa-I-Gu” (meaning 4-2-9, or April 29). What do these two stories, of Peter Liang and Soon-Ja Du, Akai Gurley and Latasha Harlins, 24 years apart, have to do with one another? What can they teach us about who we are – and who we will be – in an increasingly multiracial America? (Their) argument basically boils down to this: If these white officers got off, so should Peter Liang. But at its heart, this argument is deeply flawed. Rather than calling for accountability for all police officers who kill, regardless of their race, this sentiment is rooted in the belief that no officers should be held accountable for their actions. Yu’s and Wang’s words are separated by 24 years, yet similar in their painstaking honesty. They reveal how ethnic identification can be a powerful place from which we see the humanity of perpetrators of violence like Du and Liang, while also firmly demanding that they face justice. In doing so, they reject the false divide between compassion and accountability. Ethnic identity holds deep meaning for many of us – as a marker of sameness, a space for mutual recognition and empowerment in the face of hostility. Solidarity with those who look and talk and worship like us can be a rational response in a society that tells us that we do not belong. We form ethnic associations, temples, churches, etc. to protect ourselves from discrimination and harm, and to create spaces for cultural celebration and community. On the other hand, for those of us who are queer, trans, dark-skinned, disabled, criminalized, or otherwise marginalized, our own ethnic communities are not always intuitive places of solidarity and safety. Moreover, in a nation increasingly polarized around questions of race and democracy, those of us committed to racial justice can find ourselves pushing back against organized conservative forces within our own ethnic communities. On key political issues, we must scrutinize ethnic allegiances, and the politics of those who fan the flames of ethnic outrage. In both the cases of Du and Liang, the most conservative positions – calling to close ethnic ranks to protect one’s community, and reinforcing racist ideas about Blackness and crime – have come from ideological forces within and outside the community. 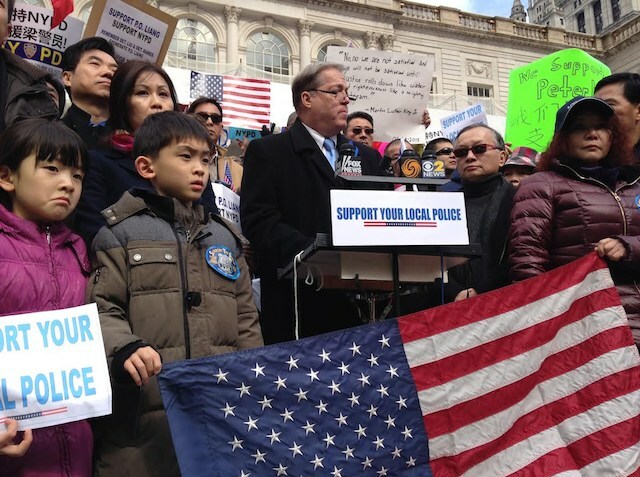 Joseph Concannon, Tea Party-affiliated Republican leader, speaks at a March 8 rally against the indictment of Officer Peter Liang. Anti-Blackness permeates the cases of both Du and Liang, in ways that extend beyond individual responsibility. Last year’s rash of deadly police shootings and subsequent non-indictments ignited a national debate over race. It made more broadly visible the fact that police violence overwhelmingly threatens Black lives. Regardless of individual officer intent, policies and practices like vertical patrols, rooted in the logic of “broken windows” policing, create deadly incentives for officers to approach Black communities in particular with predetermined suspicion, rather than with trust and service. This is nothing new, and it affects all of us in different ways. It is an ongoing challenge in the United States to understand the deeply racist origins of American policing, and to work diligently to hold the police as a public institution accountable. Beyond the issue of policing, there is another question related to anti-Blackness, one that as demographic changes continue to take hold, will determine the future course of race and struggles for democracy. It is a question of solidarity. With whom will we align ourselves, and for what? In Los Angeles in 1965, the Watts Rebellion was fueled by Black rage at longstanding economic exclusion and police abuse. More than 25 years later, in 1992, Los Angeles erupted again, fueled by similar forces. Fast forward to Ferguson in 2014, and the pattern becomes clear. Anti-Blackness in the form of brutal economic and political neglect, held in place by abusive policing, has fueled uprisings in each of the last three generations since the Civil Rights Movement. Watts Rebellion, 1965. Los Angeles riots, 1992. Ferguson uprising, 2014. Jeff Chang, in the haunting closing chapter of his book, Who We Be, describes in aching detail the effects of structural abandonment in the town of Lancaster, CA, 70 miles north of Los Angeles – a town that was once majority white and is now majority Black and Brown, where empty homes haunt the landscape, and where the prison employs more people than the school district. It is the kind of economic and political abandonment that drove Los Angeles into flames in 1965 and 1992, that drove protesters into the streets of Ferguson and beyond in 2014, and that ensured that the building in which Peter Liang shot Akai Gurley had darkened stairwells and no working elevator. In what resonates as a warning, Chang writes, simply: “From the inner cities to the colorized suburbs, abandonment is a form of destruction, a willed blindness.” This is perhaps the best description of anti-Blackness. Sa-I-Gu in 1992 awakened many in the Korean American community to the need to move beyond ethnic insularity toward a deeper understanding of race in America, to understand the political forces behind so much pain and loss. Korean American responses to the media’s framing of an underlying Black-Korean conflict ran the political gamut. Some reinforced the racist trope of Black criminality in defense of “model” Korean immigrant behavior. Others asserted a commitment to building genuine solidarity with Black communities. But how would such solidarity be built? Asian Americans were not a visible part of the Watts Rebellion, but we were certainly part of the narrative. In 1992, we were both the targets of Black racial resentment and the perpetrators of racial violence. In 2014, some Asian Americans have linked arms with Black communities to shut down police headquarters, freeways, and shopping centers. Others have remained silent. Where will Asian Americans be 25 years from now? Will we stand up against the willed abandonment of anti-Blackness that policing holds in place, or will we go it alone and get what we can as the pattern of the past three generations continues to play out? In many ways 1992 was a political threshold for Asian Americans, after which we would grapple more and more urgently with this question. It was a decade after the murder of Vincent Chin in Detroit by Ronald Ebens and Michael Nitz, which exposed the deadly racial consequences of white economic anxiety for Asian Americans. After 1992, we would increasingly become not just targets of white anxiety, but more complexly implicated in conflicts related to demographic change, neoliberal policies, and rightwing backlash – conflicts over affirmative action, immigration, criminalization, welfare, national security, gentrification, and more. Asian America is more diverse than ever before. We occupy both ends of the economic spectrum, and both ends of the political spectrum. Where we stand on key issues is less and less determined by our ethnic identities than by our politics. The generation of Asian Americans organizing today for police accountability and racial justice were politicized by Sa-I-Gu, and by the spate of policy attacks that targeted so many communities throughout the ‘90s – Blacks, immigrants, Muslims, LGBT people, women, and youth. They understand both the need for multiracial solidarity and the important role that Asian Americans must play. The fight for racial justice is our fight. For at least the last 50 years Asian Americans have been “raced” as hardworking and obedient immigrants through a model minority storyline that holds individualism, anti-Blackness, and compliance with the status quo in place. This makes our insurgency potent. And those of us directly experiencing criminalization, state surveillance, profiling, and attacks fueled by religious discrimination and fear know that Asians are still subjected to suspicion, mistrust, and hate, regardless of the model minority myth. We must not forget that Asian American identity was created as a means to struggle for racial justice. The Asian American movement formed to expand our collective capacity to identify and empathize not just with those who look like us, but perhaps more significantly, with those who don’t look like us but who share our visions and dreams of liberation. Being Asian American means empathizing with the families of Latasha Harlins and Akai Gurley as much as we do with the families of Vincent Chin, Fong Lee, Balbir Singh Sodhi, and so many others. Vigil for Akai Gurley from Zishun Ning on Vimeo. CAAAV: Organizing Asian Communities has been part of the anti-police brutality movement for decades because of our core belief that Asian and Asian American communities cannot be complacent with the current inherently flawed criminal justice system. We understand that the political and economic foundation of this country is rooted in anti-Blackness and that the criminal justice system is an extension of this foundation. Asian and Asian American communities, who are often positioned as proof that racial uplift is possible despite this foundation, have more to gain from seeking justice than maintaining the status quo. That “more to gain” will come from forging a “we” that reaches across racial lines – a “we” that is greater than the sum of our ethnic parts, built through resistance, and held together by an expansive and transformational sense of love. We can start building that resistance, and that love, here. #JusticeForAkaiGurley. Brava, sister comrade Soya. well thought out article. You are a pathbreaker. Whao Soya that was powerful. I know you will get a lot of criticism for your article but right is right. I am proud of you for going against what is popular and choosing what is right. You have thought me some good lessons about ethnicity/correctness.